Libya is shutting down production at its biggest oilfield after tribesmen and state-paid security guards seized the El Sharara facility, threatening oil workers, several field engineers and protesters said on Sunday. If confirmed by state oil firm NOC, the shutdown at the 315,000 barrel-per-day field would also force the closure of the El-Feel oilfield, located in the same remote and lawless southern desert. El-Feel usually pumps around 70,000 bpd. "El Sharara is closed," one engineer said. A spokesman for the tribesmen which call themselves the Fezzan Anger Movement, Mohamed Maighal, also said the field was shut. NOC confirmed only that guards had forced the closure of some pumps at El Sharara "which will result in on-site tanks filling within the next few hours and thus force a production shutdown," a statement said. NOC could not be reached for further comment but said it would issue another statement later. It warned of "catastrophic consequences". "Shutting down production at the El Sharara field will have catastrophic, long-term consequences, it would take a long time to resume production because of the sabotage and theft that are likely to happen," NOC said in a statement. The tribesmen stormed into the field premises on Saturday after NOC said some guards, supported by locals, had opened the gates, driving around in jeeps and filming themselves in video they sent to journalists. They stayed overnight in the vast, partly unsecured area, making good on a threat to stop production issued first in October should authorities not provide more development funds for their impoverished region. "We will not allow the El Sharara field to reopen unless the U.N. mediates," Maighal said late Sunday afternoon. He said their southern Fezzan region had suffered decades of neglect and demanded that the revenue of the oil produced from local fields be used to fund development projects. NOC was scrambling to keep the field working, working the phones from Tripoli, some 700 km (430 miles) to the north, and issuing a statement late on Saturday after a long silence saying the field had been occupied but remained "at present" open. Officials were at the same time trying to exploit the time it takes to gradually turn off wells to negotiate a last-minute solution while accusing some guards of being criminals. Field engineers say talks were complicated because the protesters were divided -- the tribesmen wanted development which would time to get under way. Members of the Petroleum Facilities Guard (PFG) were ready to end the blockage if they get quick cash, saying they had not been paid recently. The guard has repeatedly asked the state to add more men to the public payroll. 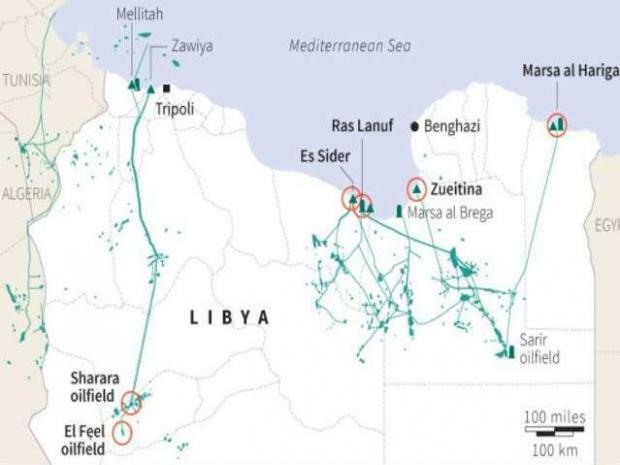 With Libya divided into two weak governments, armed groups, tribesmen and normal Libyans tend to take their anger out over high inflation and a lack of infrastructure on the NOC which they see as a cash cow booking billions of dollars in oil and gas revenues annually. Libya recently brought oil output to up to 1.3 million bpd, the highest level since 2013 when a wave of oilfield blockages started, part of turmoil since Muammar Gaddafi was toppled in 2011.